Astronauts Rest - Universe Galaxies And Stars Section. A day of rest for the astronauts. Space Shuttle and space station astronauts. Image credit: NASA. 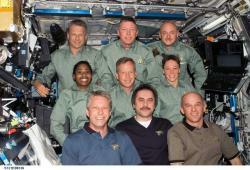 After eight days in space, and three spacewalks, the crew of the Space Shuttle Discovery will be taking the day off. Yesterday's spacewalk went well, with Mission Specialists Piers Sellers and Mike Fossum testing out methods of repairing damaged shuttle heat shields. During the mission, Sellers lost one of the caulking spatulas used to spread on the repair compound - it flew out of Discovery's payload bay area and was lost in space. After eight days in space, three spacewalks and six days of cargo transfer, the Space Shuttle Discovery crew today gets a much deserved day off. The crew woke at 12:08 a.m. CDT to “Charlie's Angels Theme Song.” It was for the entire crew, from their training team. Moments later, Texas A&M University yell leaders performed briefly for Mission Specialist Mike Fossum from Mission Control. Fossum is the first A&M undergraduate alum to fly in space. Fossum is scheduled to receive a call from Texas Gov. Rick Perry, also an A&M graduate and former member of the Corps of Cadets, at 11:58 a.m. It will air on NASA Television. Later in the day, Fossum and Mission Specialist Lisa Nowak will talk with representatives of MSNBC and FOX News Live. That interview, at 12:23 p.m., also will be seen on NASA-TV. Fossum, Nowak and shuttle Commander Steven Lindsey, Pilot Mark Kelly and Mission Specialists Stephanie Wilson and Piers Sellers then have off duty time with only a few isolated tasks and exercise planned. International Space Station Expedition 13 Commander Pavel Vinogradov, and Flight Engineers Jeff Williams and Thomas Reiter will talk at 3:13 a.m. with European Space Agency Astronaut Pedro Duque, a journalist, students and the operations manager at the Columbus Control Centre, in Cologne, Germany. At 8:09 a.m. the crew will talk with Russian journalists at Mission Control Moscow. Those events will air on NASA-TV and be replayed with interpretation at 9 a.m. The next STS-121 mission status report will be issued Thursday evening, or earlier if events warrant.